Surveyor (Party Chief) with UTEC Survey, Inc. I was lucky to land an exciting job with Odyssey Marine, a sub sea treasure hunting company based out of Florida. My post-secondary education began with a degree in Forestry Management from the University of New Brunswick where I was first introduced to some of the concepts of Geomatics. GIS was still a relatively new tool but the potential application to Forest and Wildlife management was becoming clear to everyone involved and something that I found very interesting. Unfortunately, upon graduation the forest industry in Canada was in rough shape and I was unable to secure a suitable position in my field. I decided to take a break and pursue some of my other passions before eventually landing on the decision to return to school in 2005 where I would pick back up on some of the geospatial concepts that had peaked my interest back in University - only this time around I was forgoing the land and trees for the under-explored world of the ocean floor. In 2006, I graduated from COGS with an Advanced Diploma in Marine Geomatics. 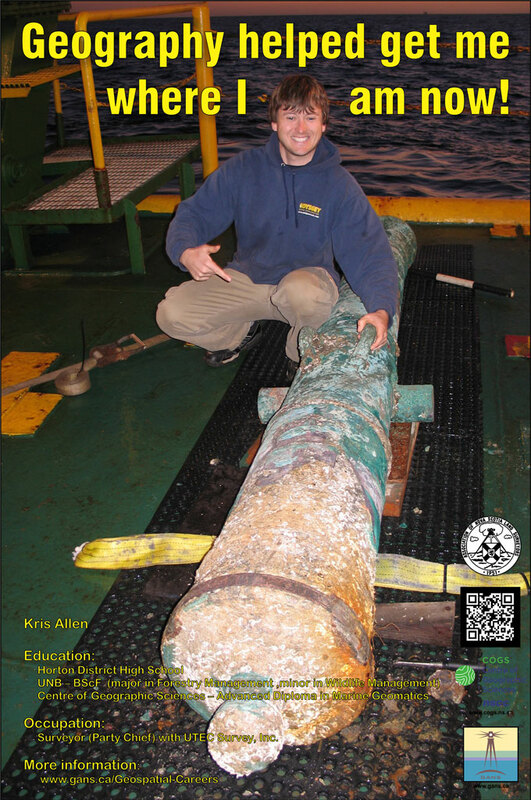 At the time, schools in Canada couldn’t keep up with the demand for students with Geomatics training and after considering many job offers I was finally lucky enough to land an exciting job with Odyssey Marine, a subsea treasure hunting company based out of Tampa Bay, Florida. I was very excited to take the practical experience I’d accumulated at school in the field of Marine Geomatics and set out on what would be a worldwide adventure in search of deep water shipwrecks! In the offshore world people with training similar to mine are generally referred to as Surveyors (or sometimes Navigators – Nav for short) and can work in teams as small as 2 or as big as 7 depending on the job scope. With Odyssey, we worked in two-person teams, with each of us covering a 12 hour shift in order to keep up with the 24 hour operations that are typical in the industry. We tend to think of ourselves as the nerve center for the entire operation as we’re the ones controlling all the positional inputs and displaying them graphically, in real time, for everyone on the vessel to see. Much of our time was spent running subsea equipment in search patterns around locations we had identified as being probable wreck sites. As the equipment is searching the seabed, it’s being monitored in real time on arrays of monitors that surround the survey station. Seeing a surveyor surrounded by computer monitors is a common site for anyone who’s ever been offshore and to us it can be overwhelming at first, but soon becomes as second nature as riding a bike. It was certainly exciting to see a potential target come into view on the screens during the search, but what was far more intense for everyone involved was when our remotely operated vehicle (ROV) would head down 2000 m to take a look through its HD cameras at what we believed might be a ship. Most of the time we found ourselves staring at piles of debris from a fishing boat, or something dumped from decades of passing vessels, but every once in a while we found what we were looking for: what a rush! I was lucky enough to be onboard for some major finds and the excitement onboard was always palpable. Once a valuable shipwreck was found, we would begin the laborious task of excavating the site. One of the first jobs was to create a geo-referenced photo mosaic of the wreck prior to excavation. We stored all of these photo mosaics in a GIS database that allowed anyone in the company to access the image and all metadata associated with it with the click of a button; it was very useful and proved a very effective marketing tool as well. With the pre-excavation work complete, our archaeologist would then lead the team in the methodical search of the wreck site. As surveyors, we would provide the precise positioning needed for such exacting operations by setting out subsea arrays of acoustic beacons with which we could track the ROV to real world accuracies of about 10 cm; none of this would have been possible without a strong background in geomatics and it was an experience I will never forget. After three years of searching the Mediterranean Sea, English Channel and Bay of Biscay for shipwrecks, I decided it was time for something new and joined UTEC Survey, a subsea survey company based out of Houston, Texas. Most of UTEC’s clients are involved in the Oil and Gas industry and I began to get accustomed to an entirely new segment of the industry as I got a crash course in subsea construction. The big plus to this side of the offshore world was that I was now working on beautiful new boats with top-notch food, Internet access and crew changes via helicopter. The engineering design tolerances for subsea construction are extremely tight - and getting tighter every year. I now find myself working with cutting edge positioning equipment as we continue to push the limits of what is possible in a constantly evolving offshore environment.